As per guidelines Service Charge is totally voluntary and not mandatory now. Hotels/Restaurants should not decide how much Service Charge is to be paid by the customer &it should be left to the discretion of customer. Ministry of Consumer Affairs, Food and public distribution has issued new guidelines on April 21, 2017 which draw the clear line on the Service Charge, being charged by Restaurants. 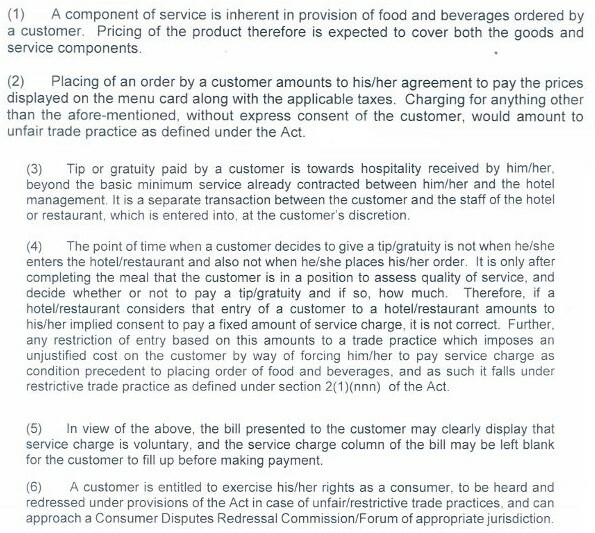 Establishments must not decide how much to charge a customer for services, instead that it should be left to the discretion of the recipient of the services. Guidelines are being sent to states for necessary action at their end, the minister Ram Vilas Paswan added.